Polycythemia is a condition in which the hemoglobin (Hb) concentration or red cell mass is increased to abnormally high levels. They are primarily due to hematologic malignancies or secondary to phenomena such as long-standing hypoxia or conditions with the increased erythropoietic drive. In clinical practice, it is suspected in persons with an increase in hematocrit (Hct) more than 52% or 48% in men and women, respectively, an increase in Hb level more than 18.5 g/dL or 16.5 g/dL in men and women, respectively, or an abnormal increase in red blood cell count. Polycythemia increases blood viscosity, which may be responsible for hypercoagulable state and may cause dysfunction or infarction in coronary, cerebrovascular, arterial, or peripheral vascular circulations. Maintaining Hct below 45% has reduced the risk of vaso-occlusive episodes than those maintaining Hct above 45%. There is also strong evidence that therapeutic phlebotomy (TP), a venerable practice that was well known since the Hippocratic era, is the most effective remedy for polycythemia. In modern days, the approved indications of TP are polycythemia vera (PV), hemochromatosis, and porphyria cutanea tarda. It has also been used as a treatment alternative for many other diseases. TP is now considered to be the mainstay of PV treatment along with cytoreductive therapies for preventing symptoms related to hyperviscosity. Outcomes from Polycythemia Vera Study Group 1 (PVSG-1) trial on various therapeutic combinations in PV concluded that patients treated with phlebotomy alone had best overall survival after 20 years of follow-up than other management. In present-day medicine practice, TP is commonly performed at blood centers in patients with high Hct. At our institution, during each session, 350 mL of blood is withdrawn daily or alternate days in patients with high Hct and followed by maintenance phlebotomy at regular intervals every 1–2 months according to the Hct level. However, the interval between phlebotomies varies widely and may be much longer than every 2 months. This study was to assess the effect of TP on plasma volume in polycythemia patients in our blood center from South India. 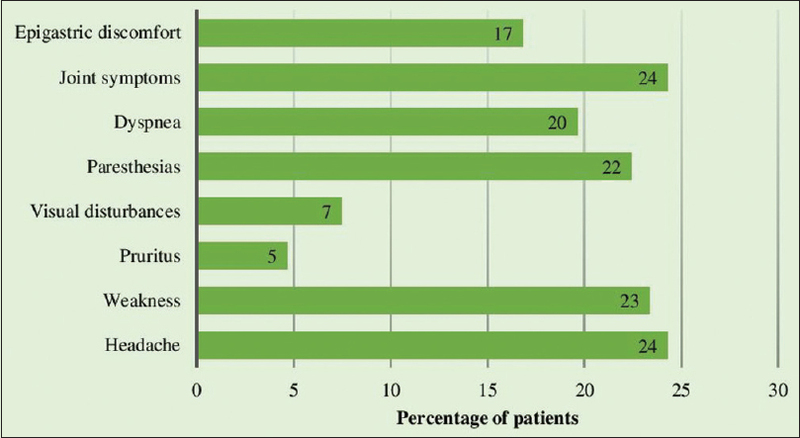 This was a prospective study on patients with polycythemia who underwent TP from September 2013 to July 2014 in the department of transfusion medicine. Written informed consent was obtained from the patient to be a part the study. The patient's demographic details were collected from the medical records. The clinical details of the patients included their presenting illness, e.g., headache, weakness, peptic ulcer disease, vision changes, and pruritis; on physical examination, plethora, splenomegaly, and hypertension were documented. Features of secondary hypoxemia as with conditions of chronic hypoxemia, heavy smoking, renal disease or malignancies, and complications due to microvascular occlusions such as thrombosis and erythromelalgia were noted. The laboratory investigations included complete blood count, JAK2 mutation; erythropoietin levels and ABG analysis where ever performed were noted. Patients were selected in whom postphlebotomy Hb was determined. The immediate changes in Hb concentration and blood volume were calculated and correlated with clinical improvement. Changes in peripheral blood volume during the phlebotomy were estimated on the basis of the Hb concentration measured at two-time points during the whole process. The predetermined Hb and Hct were considered as the initial parameters. At the end of the phlebotomy, a blood sample was taken with a clamp applied to the tubing, considering it to be the Hb at the end of the phlebotomy. The blood volume of patient pre- and postphlebotomy was calculated using Ogawa's equation, 0.168H3 + 0.050W + 0.444 for adult males and 0.250H3 + 0.0625W − 0.66 for adult females, where H and W indicate patient's height (m) and weight (kg), respectively. The Hb and Hct concentration was determined using an automated cell counter (Sysme ×3000). PV1: Precollection plasma volume; PV2: Postcollection plasma volume (Calculated from 1 − Hct × BV). In postphlebotomy, the patients' symptomatic improvement details were noted. Data were tabulated into the Microsoft Excel sheet for the analysis purpose. Data management was done using SPSS statistical software (version 14.0, IBM, Armonk, NY, USA). Descriptive analysis was used to calculate the frequencies and percentages. All the statistical analyses were carried out at 5% level of significance, and P < 0.05 was considered statistically significant. During the study, 134 patients (119 males and 15 females) underwent 236 events of TP procedures with a median age distribution of 49 years (range 22–88 years). The majority of patients were referred for TP from the medicine department (79%). PV with positive JAK2 mutation was observed only in 13% (n = 18) of patient records. The majority of patients (77%) presented with acute clinical presentation with a mean interval of 2.3 days between appearances of symptoms and hospital visit. Headache and joint symptoms were the common symptoms at the time of presentation (24% each). The other clinical presentation findings are represented in [Figure 1]. History of smoking was present in 17% of cases. Among the clinical signs, more common were hypertension (28%) and conjunctival congestion (21%) and less common were deep vein thrombosis (8%), blurred vision (4%), and erythromelalgia (1%). Only 45% of patients had undergone more than one procedure of TP. Majority of patients (66%) who presented with acute symptoms were lost to follow-up after one TP. The response to TP with respect to drop in Hb and Hct is represented in [Figure 2]. The mean preprocedure Hb was 17.6 ± 1.6 g/dL and their drop in Hb was 0.78 ± 0.5 g/dL. Their pre-Hct was 54.2% and post-Hct was 52% [Table 1]. The mean volume of blood removed in each event was 304 ± 58.1 mL. We estimated the difference in blood volume and plasma volume before (BV1, PV1) and after (BV2, PV2) TP in these patients. Difference was observed in both the whole blood (69 vs. 66 mL/kg) and the plasma volume (31.6 vs. 31.5 mL/kg) after TP [Table 1]. There was a progressive increase in plasma volume from baseline in relation to frequency of TP (0–9.08 mL/kg) [Table 2]. Only 4.8% of patients achieved Hct below 45% during the study. 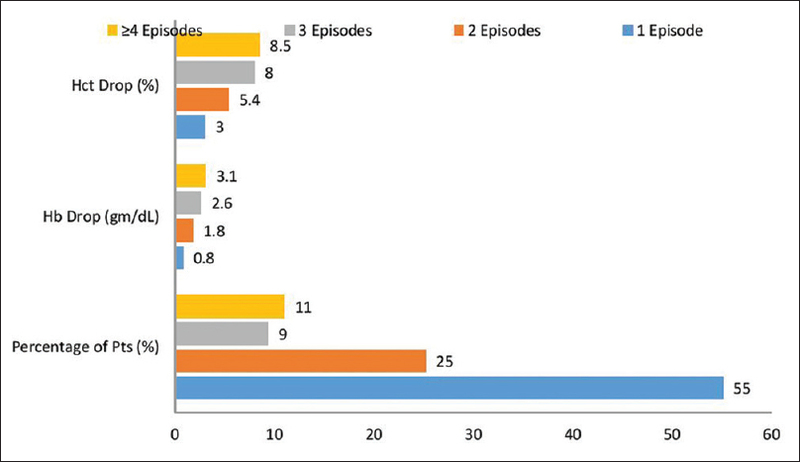 We categorized episodes based on the positive (Group A) or no (Group B) plasma expansion for respective TP procedures. Only 47% of episodes had positive plasma (1.14 ± 1.6 mL/Kg) after TP. There was a positive correlation between mean drop in Hb and Hct in procedures with positive plasma volume expansion (P < 0.01). The volume of plasma increased in the Group A was 247 ± 171 mL/kg [Table 3]. The patients with acute presentation required TP at a mean interval of 1.75 days, while for the maintenance purpose, interval was 41 days. However, six patients with congenital heart disease were undergoing regular phlebotomy at a mean interval of 90 days. Along with TP, 22% of patients received aspirin or cytoreductive agent as hydroxyurea along with phlebotomy and only four patients had both along with phlebotomy. The major goal in the treatment of polycythemia is to reduce the red cell mass, thereby reducing the effects of increased blood counts on organ function. The current recommendation in polycythemia patients was to reduce Hct below 45%. TP reduces red cell mass thereby whole blood viscosity to improve tissue perfusion and oxygen delivery. Headache is the most common presentation mostly attributed to suboptimal cerebral blood flow. Symptomatic improvements were noted in 60% of the patients immediately after TP procedure. TP by reducing blood viscosity restores coagulant activity toward normal and thereby facilitating increased blood flow through smaller vessels. It also restores optimal function of platelets and the balance between coagulation factor concentration and red cell number. The mean blood volume removed in TP was 304 mL. This accounts to small volume blood donation. The hydrostatic and oncotic forces acting across exchange blood vessels read just to help the reabsorption of interstitial fluid back into the vascular compartment. This rapid compensatory fluid exchange is usually from the skeletal muscle and skin to the intravascular space, which is expected to increase plasma volume and reduce blood viscosity. A progressive reduction in hematocrit (1.7 ± 2.6 %) and hemoglobin (0.78 ± 0.5 g/dL) in relation to volume removed and frequency was observed in the present study [Figure 2]. Segal and Bishop observed that serial TP in PV patients had significant elevation in plasma volume from 38.5 mL/kg to 48.7 mL/kg with reduction in systemic vascular resistance., Similar results were also observed in the present study and net increase from baseline was up to 9.08 mL/kg among patients with serial TP procedures. In PV, where RBC production is autonomous, with increasing red cell mass, the plasma volume remains unchanged or increases unless the Hct is >60%., Similarly, in conditions such as tissue hypoxia, with increasing red cell mass, there will be concomitant reduction in the plasma volume. Therefore, TP helps in expanding plasma volume and thus resulting in greater reduction in blood viscosity for any reduction in red cell mass. We observed that only 47% episodes of TP (Group A) had a change in plasma volume and their mean increase in plasma volume was 1.14 ± 1.6 mL/kg per episode. The mean plasma expansion in terms of volume was 247 ± 171 mL among the Group A. We could not translate why the Group B had no or negative plasma expansion. It is thought to be a continuous phenomenon and may extend after a longer duration. There was a significant difference in the reduction of Hb and Hct between the two groups. The PVSG-1 trial which followed up patients for 20 years observed that the median survival was 13, 11, and 9 years for patients receiving TP alone, radioactive phosphate (32P), and TP combined with chlorambucil, respectively. Single optimal therapy for patients of all ages will not be possible in the polycythemia setting. Cytoreductive therapy – hydroxyurea – was considered for patients with high risk of thrombosis or patients who do not tolerate phlebotomy. Similarly, low-dose aspirin daily in PV patients reduced the risk of fatal and nonfatal thrombotic events without increase in major bleeding events. In the present study, 22% of patients received aspirin or hydroxyurea or both along with TP for their management. Limitation of our study was 55% of patients underwent only one TP procedure. Only 4.8% of patients reached the target Hct within the study period. TP though commonly performed for reducing red cell mass in polycythemia had poor compliance from patients, resulting in failure to achieve the desired levels. We conclude that TP in addition to a direct reduction in total blood volume, plasma volume expansion is a relatively immediate effect making TP at once both corrective and protective. We recommend proper education and communication during the subsequent follow-up of the patients after consultation with the team of a hematologist. The effectiveness of phlebotomy in relieving symptoms due to high Hct has been observed in patients with all forms of polycythemia. Assi TB, Baz E. Current applications of therapeutic phlebotomy. Blood Transfus 2014;12 Suppl 1:s75-83. Manco M, Fernandez-Real JM. Back to past leeches: Repeated phlebotomies and cardiovascular risk. BMC Med 2012;10:53. Berk PD, Goldberg JD, Donovan PB, Fruchtman SM, Berlin NI, Wasserman LR, et al. Therapeutic recommendations in polycythemia vera based on polycythemia vera study group protocols. Semin Hematol 1986;23:132-43. Saito F, Shimazu T, Miyamoto J, Maemura T, Satake M. Interstitial fluid shifts to the plasma compartment during blood donation. Transfusion 2013;53:2744-50. Deepika C, Murugesan M, Shastry S. Effect of pre-donation fluid intake on the fluid shift from interstitial to intravascular compartment in blood donors. Transfus Apher Sci 2018;57:54-7. Campbell A, Godlee JN, Emery EW, Prankerd TA. Diagnosis and treatment of primary polycythemia. Lancet 1970;1:1074-7. Segel N, Bishop JM. Circulatory studies in polycythemia vera at rest and during exercise. Clin Sci 1967;32:527-49. Low-dose aspirin in polycythaemia vera: A pilot study. Gruppo Italiano Studio Policitemia (GISP). Br J Haematol 1997;97:453-6.